C. G. Jung was a prolific writer who published a vast number of articles throughout his creative life as a scholar. From 1900, he had also written at least one major book-length study in every decade of his life, each becoming a psychological landmark study in its own right: The Psychology of Dementia Praecox (1907), Transformation and Symbols of the Libido (1912), Psychological Types (1921), Psychology and Alchemy (1944), Mysterium Coniunctionis (1955/56) — with the notable exception of the 1930s. This is the more remarkable as this decade saw Jung at the height of his professional career and Analytical Psychology on the forefront of psychological research. But it was also the time of the quiet implementation of a major shift within Jung’s thought. The collaboration with Richard Wilhelm on the Chinese Taoist treatise The Secret of the Golden Flower (1929) marked the end of his work on Liber Novus and The Black Books, after which he embarked on the comparative study of the individuation process, first with Eastern texts, and then through his studies on in the psychological aspects of alchemy, which would finally find its expression in his major monographs of the 40s and 50s. Thus Jung’s thinking of 1930s forms the centre of his scholarly work, linking his earlier theory of the individuation process with the later psychological understanding of alchemy. However, there exists an unpublished manuscript (unknown at the time of the editing of Jung’s Collected Works), which would have been his monograph of the 30s, in which one can follow his efforts to shift analytical psychology into this new direction. The book was to be a comprehensive account of the process of individuation. In it, various parts of Jung’s life and work are linked together — childhood dreams, the children’s dream’s seminar, the ETH Lectures and his later work on alchemy. The main theme of the book is the “cohabitatio permanens” or the archetype of syzygy. In the introduction, Jung traces back his interest into the archaic remainders of mankind’s cultural history in dreams and delusions to the time of Transformation and Symbols of the Libido and demonstrates the central role of the archetype of the union of opposites within individual dreams as well as in mythologies and religious beliefs of different cultures. He gives a detailed account of the Freudian concept of bisexuality and the psychoanalytic reconstruction of the projected content that is restricted to the parental imago, whereas his own psychology aims at reconstructing the projected archetypal contents of the anima or animus and the syzygy. From here Jung follows the role of the syzygy archetype in several alchemical texts from authors such as Olympiodor, Zosimos, Pseudo-Democritus and in particular Komarios. The manuscript finished with a substantial investigation into the double nature of water in different mythologies and alchemical thought. 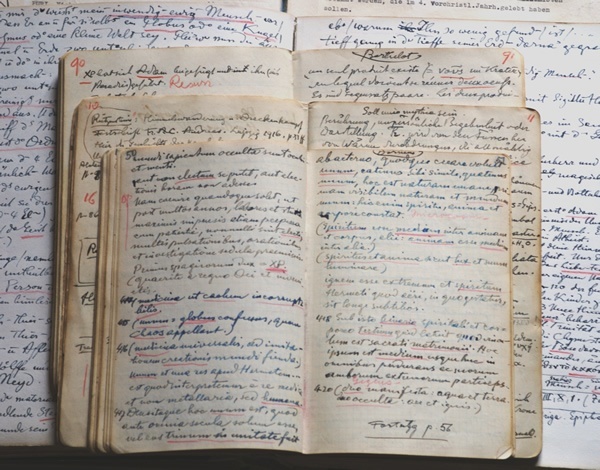 But the book was ultimately put to one side as Jung had not acquired the necessary tools to deal with this material at that time — as he explained in a letter to Peter Baynes of 27 May 1941: “I have not continued my book, since I discovered that the subject I had in mind was much vaster than my limited knowledge and moreover I did not feel that my approach was the right one. It seems to me that I am now on a better track.” As Jung replaced the project with his revisions and reworking of the Eranos lecture on alchemy of 1935 and 1936 published as Psychology and Alchemy hardly any material of this unpublished manuscript was used for other purposes. Thus the text is unique within Jung’s writings and will reveal new and fascinating aspects of his psychology. The manuscript was written around 1937. It consists of 111 pages with Jung’s original footnotes and commentaries. Although unfinished, the completed part forms an entity on its own. The editorial work will consist of the establishment of the text corpus, the completion of the references and a detailed contextualisation by means of an introduction and an epilogue that would situate the text within Jung’s theory before and after. The publication of this monograph would provide the missing link within Jung’s work demonstrating the consistency of the theoretical development of his psychology from 1912 up to his late writings. Coupled with the publication of Jung’s ETH Lectures from 1933-1941, it finally enables one to study and follow the development of Jung’s work during this highly fertile decade of his career in a comprehensive manner. The editor for the project will be Dr. Martin Liebscher (University College London), the editor of Analytical Psychology in Exile: The Correspondence of C. G. Jung and Erich Neumann, and co-editor of Modern Psychology: C. G. Jung’s Lectures at the ETH Zürich, 1933-1941 (eight volumes). The projected start date for the project is December 2020, and will take eighteen months to complete. To undertake this, the Philemon Foundation seeks to raise $196,000 to cover the research, editing, translation and adminstration of the project. We are seeking pledges towards this, which will be taken only if there are sufficient pledges to cover the cover the costs of the project. Donors to this Project will be invited to a pre-publication private seminar. All donors will be be able to purchase books in the Philemon Series at an author’s discount. Donations in the USA are tax deductible. The campaign will close in July 2020. Title	* Mr. Mrs. Ms. Dr. Prof. Thank you! Your pledge will be followed up only if we reach our crowdfunding target. You will receive an email confirmation of this pledge and we will keep you posted with regard to the progress of the campaign.